Foil products for aerospace and space. Metal covered insulation blankets are preferred when you need protection from operating temperatures above 500°F. We are capable of rigidizing, forming, and welding various metals from .002 to .010 thick. These metals typically include aluminum, stainless steel, titanium, inconel and nichrome. Hi-Temp Insulation’s metal foil rigidizing provides advantages over other methods. When fed into the rigidizer, the two rollers impart grooves into the foil, gathering the material rather than embossing it. This method prevents the gathering foil from thinning or tearing and produces a stronger finished part. Durable construction provides continuous use and long term service; even in high vibration areas. Creative attachment methods allow rapid removal and replacement for in-service inspection of protected equipment. Provide thermal protection from sub-zero temperatures to 3000°F. Liquid proof construction protects the insulation from contaminants including fuels, oils, fungus, and cleaning agents. According to FAA fireproofing regulations, commercial engine cowlings must be capable of withstanding a fuel-fed flame of 2000°F for fifteen minutes without flame penetration. To meet this requirement, there are two approved spray-on coatings, MA-25 S and 64-C1-2. For some time, many in the industry have been aware of reverser core failures resulting in heat induced degradation going unnoticed under spray-on coatings. Hi-Temp Insulation provides removable reverser insulation blankets for CF6-6, CF6-50 and CF6-80 engine series. Each insulation blanket performs as a fireproof barrier in accordance with FAR 25.1191. The blanket tests were conducted in compliance with the criteria and requirements set forth in Federal Aviation Administration Advisory Circular AC 20-135. The insulation blankets prevent a burn through and/or backside ignition for a minimum of fifteen minutes. Following is a list of the advantages removable insulation blankets offer over spray-on coatings. Many of these advantages were detailed in an article written for Aerospace Engineering by Paul Romnes, Engine Technical Services Maintenance Operations, United Airlines, San Francisco, CA. Elimination of toxic emissions during the surface preparation and spray-on application of ablative insulation coatings. Elimination of disposal problems associated with the coatings when removed for inspection and with the chemicals used during removal of the coatings. Elimination of special training and handling. Elimination of special purpose spray containment facilities. Blankets are manufactured to tool controlled tolerances. Blankets are configured to pan down in specific areas to improve fit and avoid interference problems. Blankets are designed around areas where insulation is not required, rather than applying a coating to the entire area, reducing overall weight. Mechanical fasteners are used to precisely position and positively retain the blankets in place. Blankets are not affected by high vibration levels of an in-flight environment that can cause fragile coatings to disintegrate. Blankets are fabricated to tool-controlled dimensions. Blanket thickness is controlled by both quilting the insulation core and heat curing the final lay-up under vacuum. Blanket thermal efficiency is superior to coatings, and remains consistent due to controlled thickness and improved durability. Blankets are not as easily damaged as coatings during maintenance. Blankets are more resistant to typical aircraft contaminants than coatings. Blankets do not require top coats like those used as a binder for coatings. Blanket repair can be done “on-wing”. Blankets are easily removed and reinstalled for fan reverser inspections. Reverser bond lines, between the hot-side surface and the honeycomb core, can be inspected more frequently due to improved accessibility. With improved accessibility, a more reliable “tap test” and visual inspection can be performed. Reversers require less repair time since coatings are not being removed and re-applied. Blankets last the life of the reverser under normal conditions. Maintenance costs are reduced compared to removing and re-applying coatings. Costly special handling, needed to use the highly toxic components of the coatings, is eliminated. Products related to the coatings, that have a limited shelf life and must be stored, are eliminated. Maintenance downtime for reverser removal and reinstallation, is reduced from ten days for coatings, to less than twelve hours for blankets. 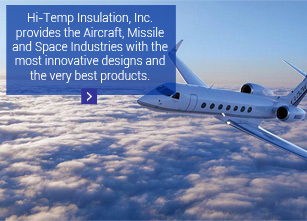 Hi-Temp Insulation’s broad range of abilities in the sewing segment is unmatched in the Aircraft, Missile, and Space industries. Working closely with material manufactures, we have developed fabrication techniques for a variety of materials; including carbon, graphite, ceramic, and nicalon. We continually provide sample insulation blankets to major contractors and government agencies for testing. This experience has made us the primary supplier of sewn insulation blankets on such critical programs as the Boeing 777 Commercial Aircraft, Delta and Atlas Launch Vehicles and the Space Shuttle. To protect and seal sewn insulation blankets, Hi-Temp Insulation uses a wide variety of facing materials including coated fabrics, mylars, and films. In addition, using stainless steel thread, foils up to .002 thick can be sewn to insulation blankets for liquid proof protection at high operating temperatures. We also specialize in diamond quilted blankets as specified in Mil-I-7171 for thermal and acoustical applications. In addition, our custom designed sewing machines are able to quilt blankets up to 60″ wide and 2″ thick. We use an interlocking quilt pattern that secures the insulation between the inner and outer facing fabrics even if a thread breaks. This unique method was used to fabricate the white exterior panels for the Space Shuttle. Removable duct insulation is currently used on a variety of military and commercial aircraft applications. Insulation is molded in half sections to a desired density, thickness or shape; then covered with films, coated fabrics, or metal skins. By combining molded materials with various protective facings, Hi-Temp Insulation offers removable duct insulation for temperatures to 2600°F (1427°C). This process provides a very durable assembly that will stand up to continuous vibration and frequent handling. A variety of attachment methods are used, depending on the insulation covering, to allow the duct insulation assemblies to be easily installed and removed. When covering the insulation with film, the assembly is fabricated allowing the covering to overlap the split line. The overlap is then adhered, or heat-sealed, to the mating portion. For coated fabrics, pressure sensitive tapes provide a secure and easy attachment. When the insulation is protected with a metal covering, capstans can be installed allowing the half sections to be laced on. The insulation is molded into a variety of sizes, shapes, thickness and densities. This versatility allows the insulation to custom fit odd-shaped parts, special configurations, and applications where precise fit is critical. The type of insulation that is used is dependent upon the environment and the temperature of the duct during operation. Molded duct insulation is available with a number of covering materials including films, coated fabrics, and metals. A cover adds stability to the insulation while providing various methods for attachment. Temperature and environment are the critical elements that determine if a cover is required and which type to use. Hi-Temp Insulation is a leader in designing and fabricating insulation blankets for applications requiring thermal protection with fire stop capabilities. As a fire stop, in accordance with FAA requirements for aircraft protection in an emergency situation, these blankets are able to stop a 2000°F flame for 15 minutes with no burn-through. Meeting this requirement allows our blankets to replace the brittle, short lived coating now used on many commercial aircraft jet engines. As a thermal barrier, when exposed to temperatures up to 2000°F for fifteen minutes, backside temperatures can be reduced to 380°F. Because of this unique ability, lighter weight aluminum or composite structures may be used, even near a fire wall. Under normal operating conditions, there is no essential thermal property loss when blankets are exposed to gravitational stress, intense engine vibration, or repeated heating and cooling cycles. Flexible, lightweight, and durable, many of our blankets have been in service since 1983 requiring minimal repair or replacement. Flexible coated insulation blankets can be custom designed to fit almost any contour. Numerous attachment methods are available, including capstans, grommets and stainless steel fastening tape.